The roster of designers in Fashion Designers at the Opera is impressive: Giorgio Armani, Karl Lagerfeld, Miuccia Prada, Marc Bohan, Christian Lacroix, Gianni Versace, Tai and Rosita Missoni, and many more. The roster of composers is equally impressive with the likes of Handel, Bizet, Mozart, Strauss, Berlioz, and others. These two groups of overachievers yield the crux of material for a beautifully executed volume which turns out to be a love story between so many of these designers and the opera. Almost unanimously, these designers share the appreciation, love, and knowledge of this musical arena. Each chapter, devoted to a single designer, is filled with revealing interviews and information that enlightens and tells the reader in descriptive detail what is entailed to accomplish each collaboration and production. There is no question that the reader would enjoy all of this much more if he or she had some knowledge of opera, yet as a non-opera buff, this reader was taken in with the stories, lessons, and observations of each particular designer and their corresponding productions. Imagine the likes of Giorgio Armani and Karl Lagerfeld saying that they realize that they must cede their creative talents to a “boss” rather than being one who is omnipotent and that they relish the change. Imagine these modern masters of clothing design stating that they had to give up their principles regarding the creation of what they would consider a perfect garment for an individual moment, event such as a fashion show, or client, only to become more concerned with the “broader stroke.” The undertaking requires the designer to appeal visually to a huge audience rather than to the tastes of an individual retail client. There was one disappointment with Fashion Designers at the Opera and that was in the documentation of the costumes, which relied more heavily on sketches rather than actual photographs. This disappointment stems from a heavily engaged fashion reader rather than the more operatically inclined reader for whom the sketches would have proved sufficient. 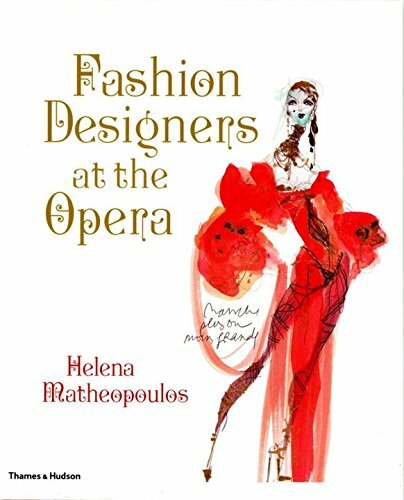 Ms. Matheopoulos has provided a scholarly yet highly entertaining volume where both opera and fashion share a stage. The ideal reader is equally opera buff and fashionista—or simply someone who is totally engaged in the creative process.